Katharine started her firm, Access Immigration, in 2012. She enjoys the ever-changing, challenging nature of immigration law, the research it takes to stay up-to-date on the law, and the ability to apply that knowledge to her client's cases. Katharine used several legal software options before upgrading to MerusCase in 2016. She initially heard about MerusCase from a fellow member of the American Immigration Lawyers Association (AILA). MerusCase has many features that streamline a firm's daily workflow. I asked Katharine about the tools she uses to boost her firm. Q: What day-to-day operations and procedures has MerusCase made easier? A: I use a lot of document templates. Before MerusCase, I was using a different piece of document automation software, but it had some issues. It didn't work with Mac computers, and it was pretty complex to learn and teach my staff how to use. It didn't work with my practice management software either. Now, I have a ton of custom templates. My staff is always asking me, "Is it in Merus?" because it's so easy for them to fill it out and personalize it. I enter data in one place, I update the mailing address one time, and all of my templates are completed with that new information. I don’t have to do it in two places. It’s really easy for my staff to understand how to create these templates. There are so many documents that we send over and over again. These templates are a lot easier for us. MerusCase has many features created specifically for immigration firms, such as Immigration packet tracking and built-in court forms. I asked Katharine about how her firm uses those tools. Q: Which Immigration-specific features do you use frequently and find helpful in MerusCase? A: Court forms. I use Merus for all my court forms. I had looked at some other case management software options that didn’t do that [automate court forms]. It's really much better to have it integrated into the case management software. I always use that function. I also think the immigration packets are really useful. Q: When you give advice to a firm that is considering MerusCase, what do you say? A: Most immigration lawyers I know are solos or are in very small firms. It’s very frustrating to have a case management software company that does not listen to you or understand you or respond to you. Every time I’ve reached out to MerusCase support, they’re always really receptive to feedback, which is great. I would say they are way better than any other service provider. Merus has really been a great partner in setting up my case management software, answering my questions, and making adjustments. It’s been really easy and definitely has lowered my stress level when it comes to having a case management software that works well for my practice. 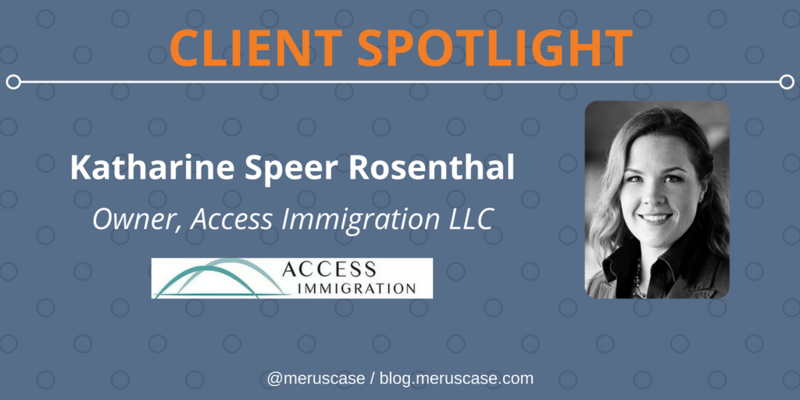 Thanks to Katharine Speer Rosenthal of Access Immigration LLC for her help with this Client Spotlight. Interested in having your firm in a Client Spotlight?